Spur of the moment food trips are sometimes the best. This spur of the moment trip happened to be one of the ultimate travel culinary highs that I’ve ever experienced, and I’m going to share it all with you in this blog post. Chef Hiroyuki Sato – a master of sushi! I get a message from my friend David – The Hungry Tourist. He’s one of the most genuine food and people lovers, as well as food connectors, that I know – and he’s at the top of his game when it comes to the best of the best, and the ultimate quality of everything he eats. A day later, my wife and I were on a flight from Bangkok to Phuket. It was the food opportunity of a lifetime! Sri Panwa – One of the most luxurious hotels in Phuket! We arrived to Sri Panwa, located on a southern cape of Phuket, it’s known to be one of the most exclusive hotels in all of Phuket. Since Sri Panwa is so hilly, you are transported from building to building by little mini trucks, like oversized tuktuks. It adds to the experience. After checking in, we settled into our garden villa. The room was clean and modern, being semi-minimalist, while having everything you could possibly need and more, all within the villa. 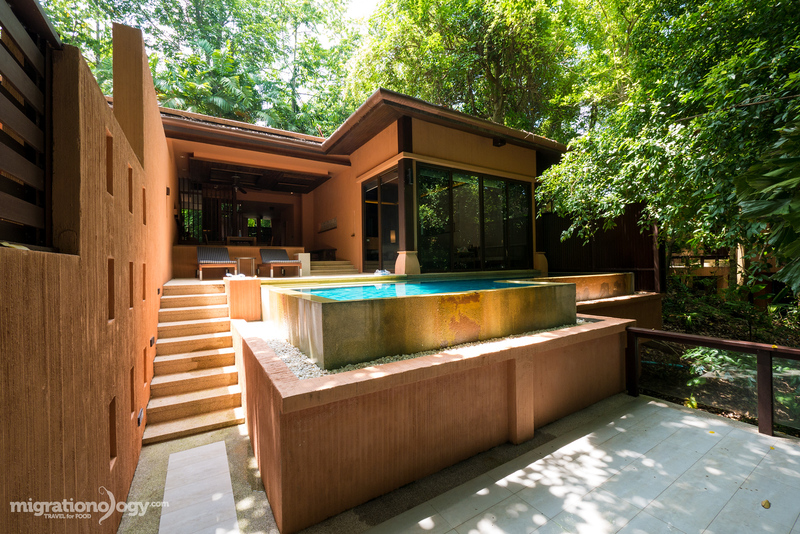 The private swimming pool, and not just any swimming pool, but a saltwater swimming pool. I sat in the pool for hours at a time without my eyes ever hurting from any chlorine. So the way the food pop-up worked is that it took place for 2 nights, so the first night was sushi, and the second night, Kobe beef. My excitement was at a peak. Before our sushi meal, which little did I know would be the best sushi meal I’ve ever had and give me a new perspective on sushi, I met up with David at Baba Nest at Sri Panwa. 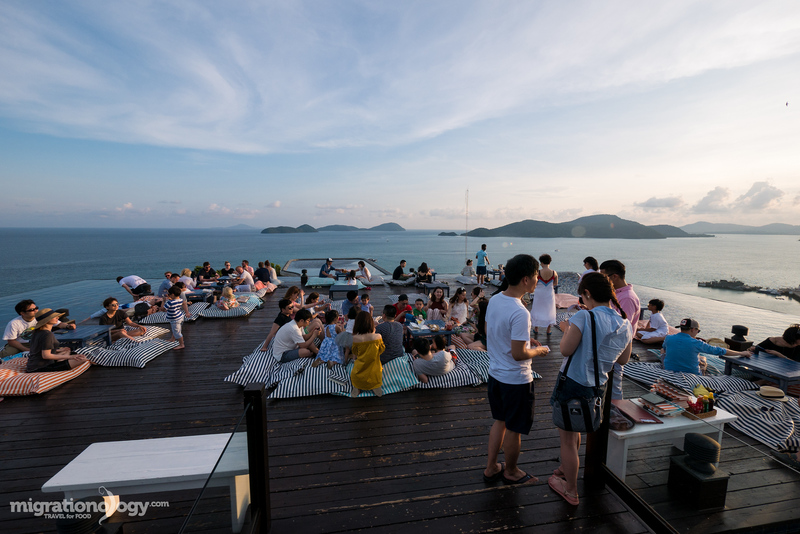 Baba Nest is a world renowned rooftop bar, known for its views, which are nothing short of breathtaking. Master Sushi Chef Hiroyuki Sato is one of the most renowned and up and coming sushi masters of Japan. His restaurant in Tokyo, Sushi Tokami is a Michelin starred restaurant. In the Japan Times review of his restaurant, they mention that he demonstrates creativity and knowledge in choosing some of Japan’s finest fish. Also, Chef Hiroyuki Sato is just such a friendly nice guy. 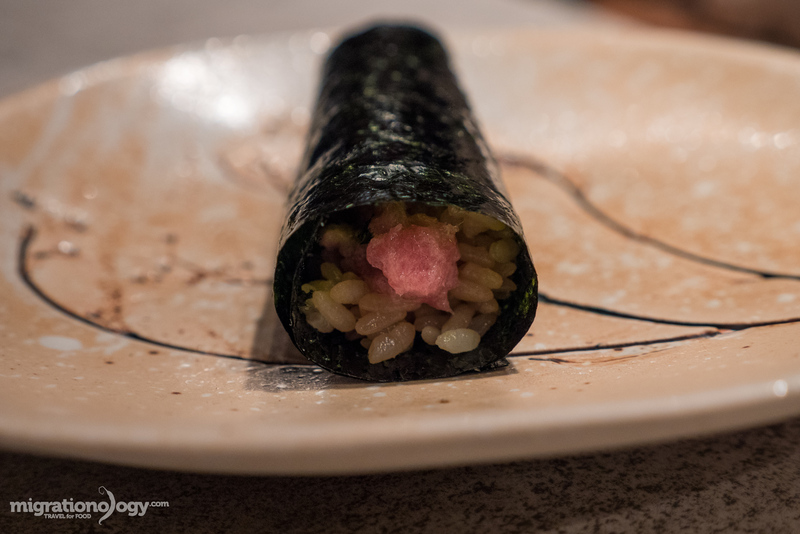 We sat down for sushi, and before I even knew it, chef handed me a tossaki (some part of tuna from the neck) minced in a hand roll with seaweed. The seaweed collapsed and was so crisp, the minced fish melted on my tongue like ice cream melts, and the rice was lightly soured to balance it. That was the beginning of 22 pieces of the best sushi I’ve ever had. 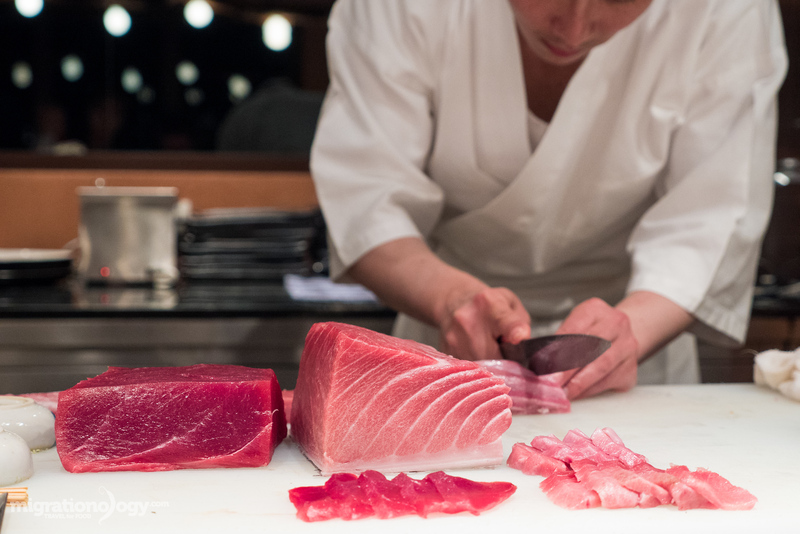 The attention to detail, the temperature of the fish and rice (which is of huge importance), and watching Chef Hiroyuki Sato make each piece of sushi, and personally hand it to you, is what made it so special. We can’t cover all the courses here, or you’d be scrolling for days, but a few of my favorite pieces were all pieces of the tuna, from red meat (akami) to the fatty tuna belly (otoro), the baby snapper, sea urchin, and rosy seabass. I did not want the sushi to end, ever. I literally dreamt about sushi that entire night. Woke up in the morning at Sri Panwa, had a swim, and then had breakfast at the hotel. 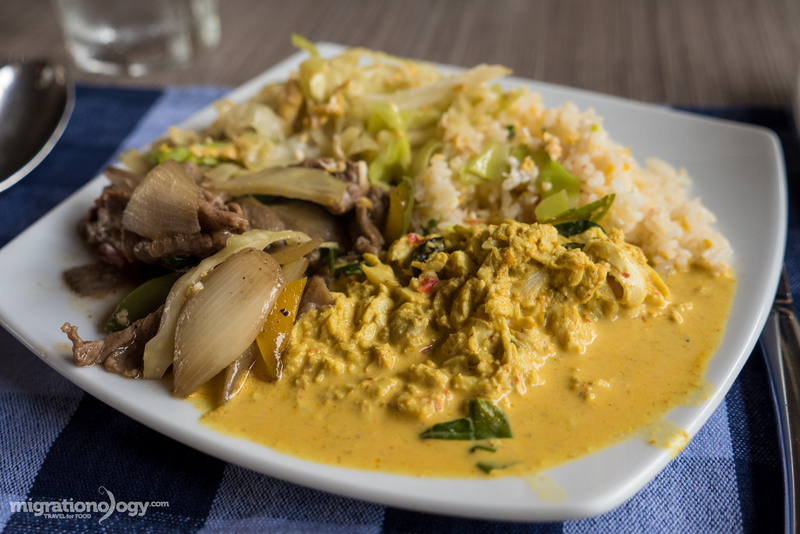 That was good too, including southern Thai crab curry – I can handle that for breakfast everyday! Spent most of the day lazying around, and swimming in the saltwater pool, and hiking around Sri Panwa. 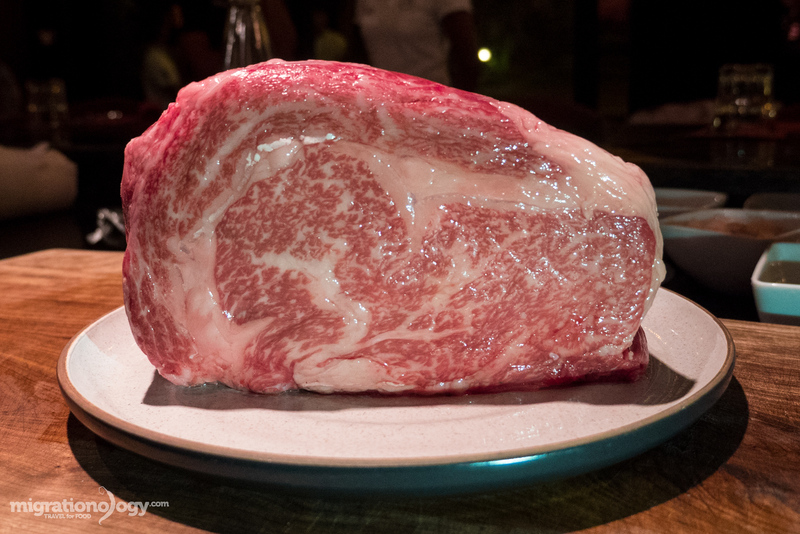 The crew that makes up Wagyu Mafia are originally wagyu / Kobe beef dealers (just to clear it up, Kobe beef is from the Tajima strain of wagyu cow – so Kobe beef is a type of wagyu cattle). Due to the demand for the beef they were buying, and their knowledge of wagyu beef, they decided to open an exclusive restaurant in Tokyo. They know Japanese beef better than just about anyone. Along with a variety of wagyu parts and pieces from cattle breeds directly from farmers they personally know, they brought an entire 3 kilo hunk of Kobe Beef A5 ribeye (best of the best quality). It was one of the most amazing things I’ve ever touched. In Japanese fashion, we enjoyed an omakase meal course, where the chefs serve you the best of the day. 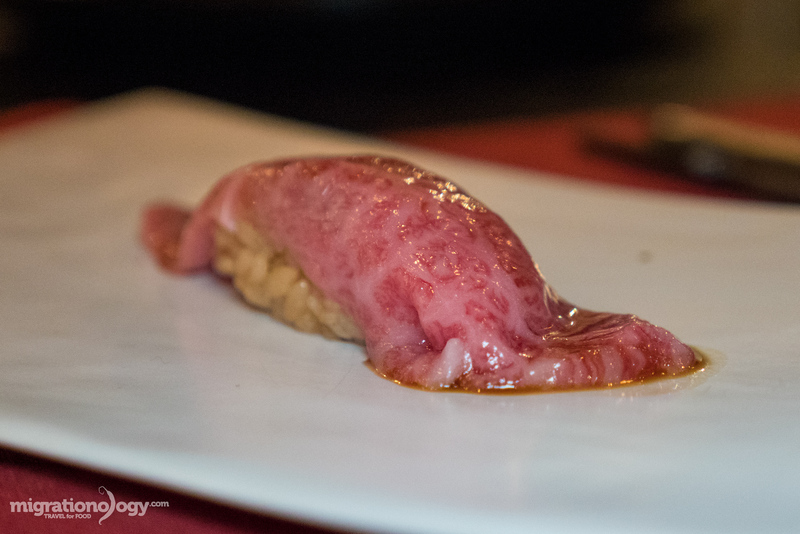 Although every wagyu beef bit of the entire meal stood-out to me, and was beef like I never had before, something I still can’t get over is the oyster blade Ozaki beef nigiri sushi. I can still vividly remember how it turned to liquid in my mouth without me even chewing. There it is, Kobe beef of dreams! Then came the Kobe beef ribeye (Kobe Beef A5 BMS11). It was baked in a wood fire oven until the outside was dark and smoky but the inside was bloody and red. A taste of this beef could bring anyone to tears! The beef was the purest, softest, and most flavorsome piece of meat I’ve ever tasted. It was immaculate and perfect, without the need of anything to enhance it. Again, an omakase sushi meal by Master Sushi Chef Hiroyuki Sato and courses of wagyu Kobe beef by Wagyu Mafia, were two of the most gourmet, high quality, and precise meals I’ve ever had. Both truly care about the ingredients they serve, and know how prepare them in a way that magnifies their natural tastes and textures. 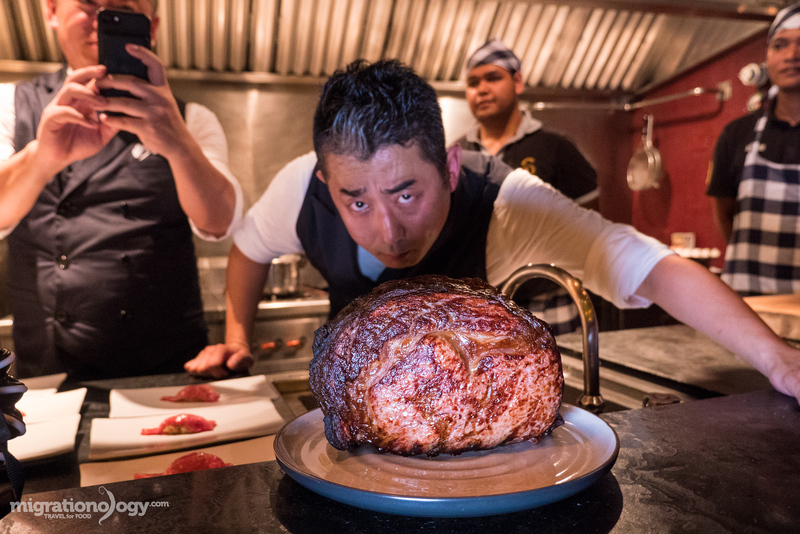 And on top of the amazing food, both Chef Hiroyuki Sato and the crew from Wagyu Mafia, are all just extremely friendly and fun to hang out with. If you have a few minutes, press play to watch the video of this sushi and Kobe beef meal and Sri Panwa! 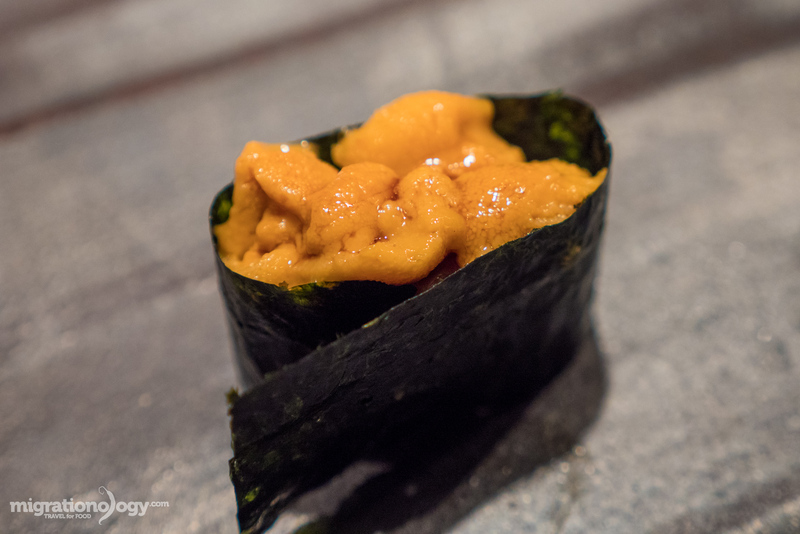 Sushi and Kobe beef pop-up at Sri Panwa! I was invited for a spur of the moment trip by my friend David, who organized a Japanese sushi and Kobe beef pop-up at Sri Panwa Hotel in Phuket. The first night sushi was served, straight from Japan by Master Sushi Chef Hiroyuki Sato. The quality and care of his sushi making was astounding. The next evening, I had a Kobe beef meal from Wagyu Mafia. 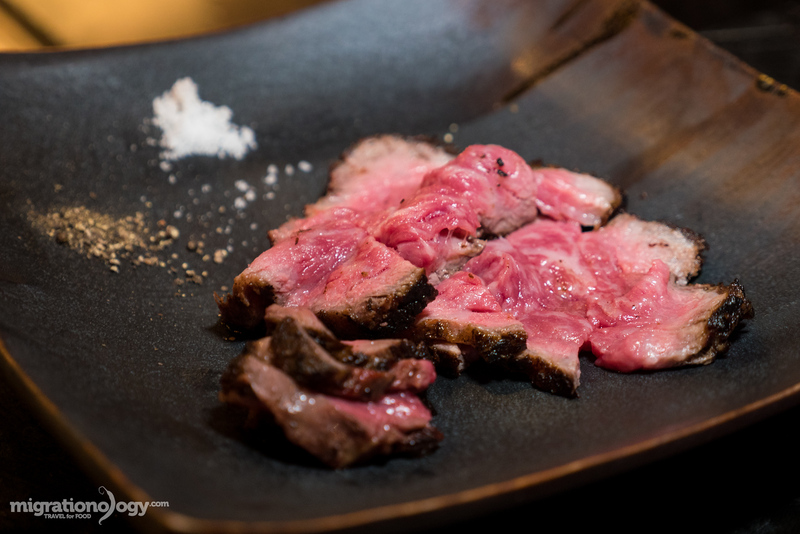 The Kobe beef A5 ribeye was enough to make anyone cry tears of joy. It was a gourmet food opportunity of a lifetime, and it was a huge honor to be invited. Thank you to Khun Wan and all the staff from Sri Panwa, David Califa, and the chefs for this amazing event. DISCLOSURE: I was invited to attend this event. I did not pay for the food or my stay at Sri Panwa, but I was not paid to write this, and I chose to post this article (and video). All thoughts and opinions are my own. 39 comments. I'd love to hear from you! Mmm. Food as art – in appearance and taste. Thanks for bringing this to life! Waahhh !! The video of sushi and Kobe beef meal and Sri Panwa…. amazing!!! Wow! That sounds like a great trip and the food looked amazing. I am going to Thailand next year and Phuket is on the list of places to visit. I will definitely check out the hotel you stayed at. It looked fantastic. Thailand is really beautiful country. Its very interesting article and I use it for planning my next trip. That Baba Nest rooftop Bar at Sri Panwa looks amazing. I’m used to American steak, like the filet mignons and ribeyes, and I would love to try Kobe beef (man that Kobe beef on your photo looks fantastic). Have tried Wagyu but it was a Wagyu burger from TGW Tea in Singapore. Wagyu beef is super expensive here in the States and is only available in select high-end steakhouses. Great Blog. Interesting Photos. Beautiful Resort. Thanks for sharing this information with us. I was googling flights to Brazil. I have no idea how I ended up here but now I’m looking at flights to Thailand again. Your pictures make that food look edible through the screen ha. Sri Panwa looks beautiful! I love the private pool and the view from each of the villas overlooking the ocean is just amazing. I’ve also heard a bit about Sushi Tokami! If the food tastes as good as your photos, then I’m on my way! That Kobe Beef roast looks amazing … need to try it soon! That beef makes me wanna eat the monitor! I need to check out this hotel the first time I’m visiting Thailand. Looks like you had an amazing trip, thank you for sharing! The food looks amazing! I’d fly for Kobe beef too, only had once in Kobe and still drooling when thinking about it. Oh I also love the saltwater swimming pool in the villa that doesn’t come by often enough. Oh my gosh I am so jealous, this literally looks like the nicest joint of beef I have ever seen. When I am in Thailand next I need to stay here. Wow. Extremely wonderful. I watched this video on youtube and many other videos on Migrationology.com’s channel and today I read a detailed article on your experiences. Great, excellent, wonderful. The luxury resort, stunning view, very beautiful in Phuket, extremely fresh and delicious sushi pieces and especially is the number one and the most expensive beef in the world: Wagyu beef. You are so lucky, traveling around the world and experiencing different cuisines in many many countries, share your travel experiences. I really like this and I’m also building a blog about travel, which I like. Hope someday I will also go and experience like you. This life is wonderful, worth living. Wish you and your family health, and do not forget to share wonderful experiences like this. Thank you very much. Good luck! Two years ago I was in Japan. Tried the local cuisine, I was carried away by it, that I enrolled in the courses of Asian cuisine 🙂 This is not my first passion for exotic dishes. I often learn about new dishes and culinary exhibitions in Hong Kong and other Asian countries. You can learn a lot from such a rich culture. 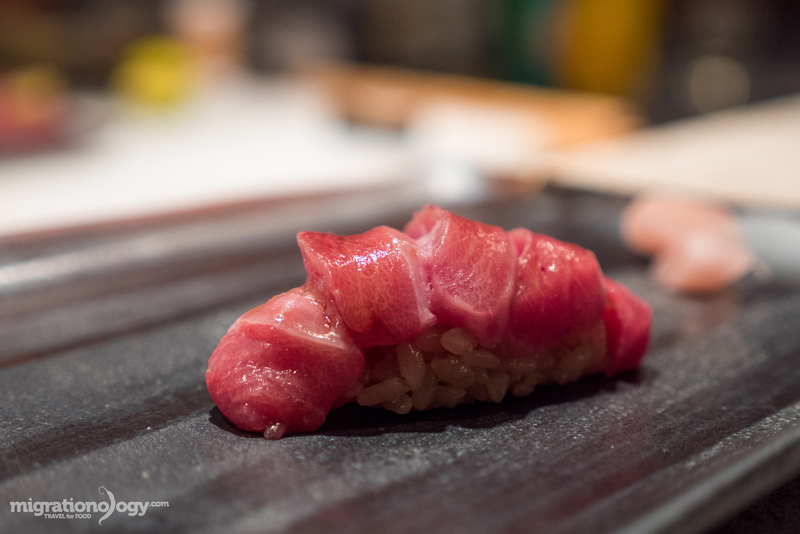 For example, I learned how to cook sushi, kobe beef will be the next one that I would like to try. Amazing photo and article. I have had Kobe but not quite like this and not in Phuket. It’s definitely on my bucket list though as food is the main reason I travel I must admit. Mark, you have good friends. But than again you deserve it! This food looks delicious and I am vegetarian! Hai Mar! I am a huge fan of you. I subscribed you channel and your blog as well. I have a plan to visit Thailand as a short trip to all the ASEAN countries. Can you suggest (or post an article) about 10 best spots (and food of course) in all of Thailand (not just in Bangkok). Thank you Mark! Keep posting and vlog your foodie crazyness! Hi Mark, I travelled many times for travel business and usually stay north of the island at Pullman Nai than. I did experiment Sri Panwa few time for a nice cocktail. I wasn’t aware of the quality of the meat restaurant and sushi bar. I will definetly recommend it to my clients. Thanks for sharing your experiences, i ll take good note. Mark, thanks for your videos of travel, food, and friends, they are so excellent. Looking forward one day to also enjoy this journey. The food looks incredibly fresh and the resort is in an amazing spot. I stayed there years ago when it was under different management but it sure does look like the place for a relaxing holiday with plenty of good food. Great to see you’re still eating your way around Asia! Thank you very much Christina. Hope you’re doing well also! What a beautiful meal! Thank you for sharing your love for food with us. I am not sure if you are familiar with C.S. Lewis’s, Space Trilogy, but your love for food reminds me of a section in one of the books. Ransom, the character, ends up on a new untainted planet. He bites into the fruit and loves every single bite as if it is the most delicate and satisfying bites he has ever experienced. After finishing the first fruit, he reaches for a second, but then has a check in his spirit. He was fully content with the first fruit, and to reach for a second felt wrong. Ransom enjoyed the fruit as God had meant it to be enjoyed. You enjoy food as God intended, and your love shows through! Thank you for enjoying the first fruits so well! Hey Alexander, great to hear from you, thank you so much for your kind words of support and for sharing that story. I’m familiar with C.S. Lewis but haven’t read that book yet, I will try to read it soon. That’s amazing, really appreciate it! 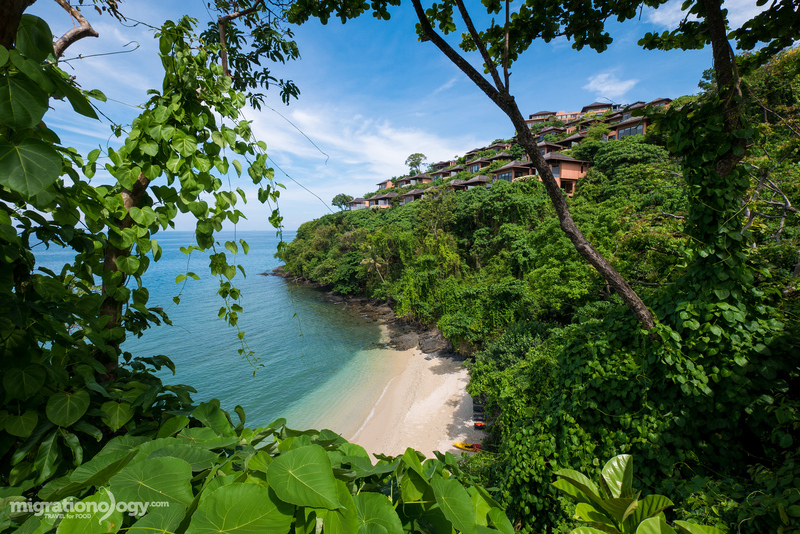 That resort in Phuket looks amazing … I hope it doesn’t cost too much! Hey Monica, thank you very much for reading and watching. Yes, I’m not sure when yet, but I would absolutely love to spend time traveling around China. Really hoping to sometime this or next year. Hope you’re doing well! I’m so glad I’m not on a diet right now. Those pictures looks extremely appetizing!!! Two days of food tripping! That’s a great adventure indeed! Great post Mark! Thanks for such a lovely and informative articles shared with us. 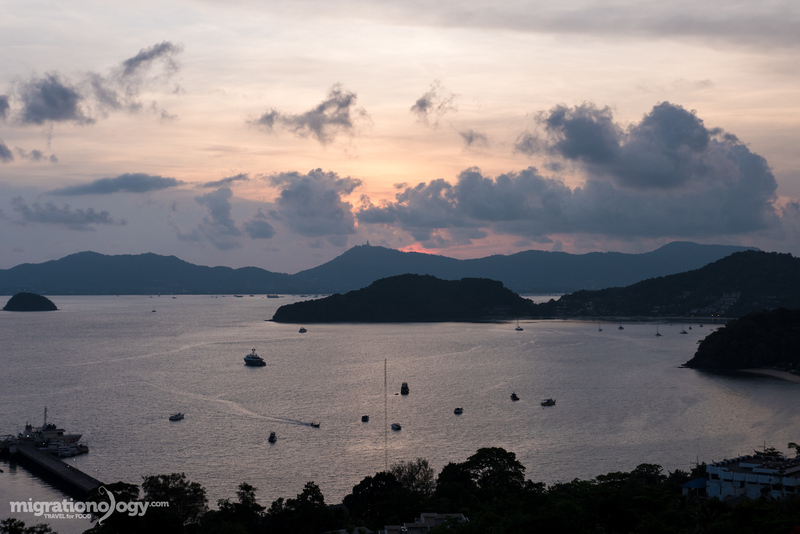 Really amazing post about Phuket. Thanks Again. Looks sensational. What an amazing experience. Thank you very much Jolene!